The clippings from the Los Angeles Mirror-News, The Los Angeles Times, The Los Angeles Examiner and The Long Beach Independent are faded now. 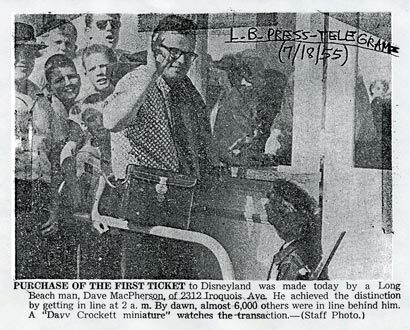 So is the photo of 22-year-old Dave MacPherson giving the OK sign as he became the first customer to buy a ticket to Disneyland when it opened to the public July 18, 1955. But the now-72-year-old MacPherson is anything but faded. 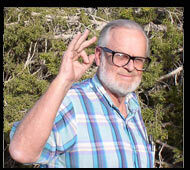 A humor columnist for the San Juan County newspaper, he lives in a cabin in Monticello. He escaped what he calls “Quakafornia” 20 years ago, but still uses his lifetime pass to visit Disneyland regularly. “I am old enough to be historical,” MacPherson said. When Disneyland opened, MacPherson lived 10 miles away from the then-sleepy farm town of Anaheim. He was a student at Long Beach State University, where he worked for the college newspaper. He watched the hoopla of the “invited guests only” televised opening on July 17 — a Sunday — seeing guests such as Ronald Reagan and Art Linkletter join founder Walt Disney. Some commentators said the new theme park would be “Walt’s Folly” because of myriad opening-day problems. MacPherson rode his Simplex motorbike, capable of going about 30 mph, to the big parking lot to be the first person in line. It was 2 a.m. and MacPherson heard technicians testing animal sounds for the Jungle Cruise ride. Before the day was over, 6,000 people would queue up behind him. 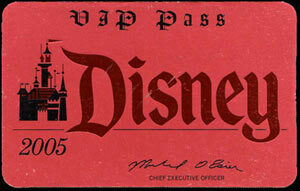 * Roy Disney, Walt’s brother, requested the first printed ticket for his grandchildren’s memorabilia. * The park opened a day early for special guests and the news media. 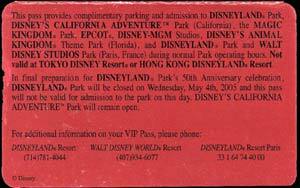 Some printed counterfeit tickets, and some party crashers climbed over fences surrounding the attraction. * When Disneyland opened for the public on that hot, humid Monday, Walt Disney posed with Michael Schwartner and Christine Vess, the first two children in line. MacPherson was the first to enter the park. But, surprisingly, he did not ride any of the new attractions or get Walt Disney’s autograph. Some time later, the Monticello resident learned he had won a lifetime pass to Disneyland for himself and three guests. He has received that annual card each year since 1955. Its use has expanded to Disney parks in Florida and France. MacPherson has used the pass often. His favorite ride is the Enchanted Tiki Room, an attraction he says is “for the birds.” He also likes the Haunted Mansion. But he misses the 360-degree movie. The last time he went to Disneyland was 2004. But the first member of the public to buy a ticket to “the Happiest Place on Earth” probably hasn’t seen the last of the park he helped open.